The amateur trader wants nothing more but to meet specs and avoid the possibility of tension. The professional trader knows how to wait for the best trading opportunity. He/she is patiently waiting for all the stars to align before pulling the trigger. The professional trader is prepared to skip trades if they are not in line with his/her trading strategy. The amateur trader always ends up overtrading and is usually increasing the trading size after a losing streak. The professional trader is not looking for perfection, whereas the amateur trader is always on the search for a holy grail. Trading is a journey and not a quick one; if you want to become a professional trader, you must follow strict guidelines and have a predetermined plan in case things go against you- and they almost always do! 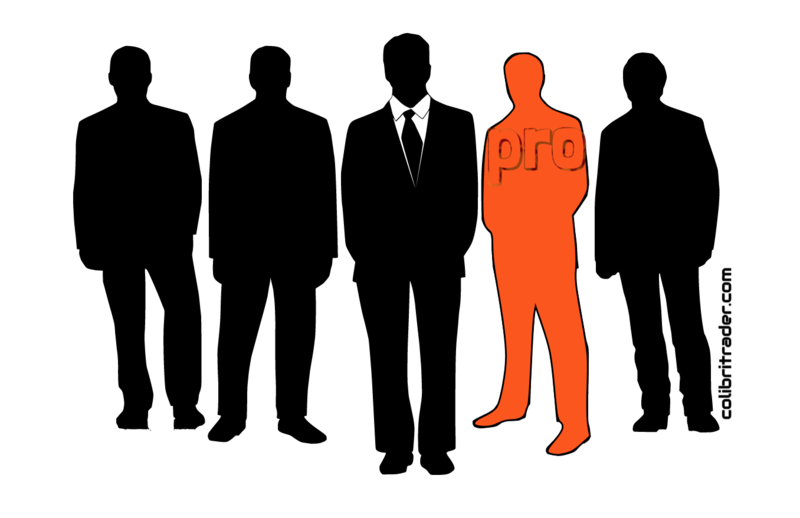 In order to get to the professionals’ league, you should start with the right trading mentor. Your journey should not stop there. Even if you find the best mentor, he/she cannot teach you how to be profitable. They can equip you with the right tools and give you the roadmap for success, but ultimately it comes down to you. If you don’t follow these rules and if you start jumping from one strategy to another, you will certainly end up either as a losing trader or quit trading. Therefore, professional trading is more than everything else a long journey to self-discovery that uses a predetermined roadmap. That does not mean that it is always predictable and clear- quite the contrary- trading is like discovering the same mountain peak by taking a different route every time. The professional trader realises that the next level trading is in his/her willingness to stare down the risk and to embrace the void of possible failure. Professional trading never excludes the risk of failure. In fact, the very good of traders never underestimate this possibility and make everything possible to protect themselves against such risks. Different options are possible, but one of the most frequent ones is to divide your capital between different brokers and to always have capital at a bank that is not tradable. So, let’s say you want to trade with 1,000USD. What a professional trader might have done is take 500USD and put them in a bank. The other 500USD, he/she might divide in 5 equal parts and trade with 5 different brokers. These are of course hypothetical figures. Some traders might prefer to use only 2 brokers and not put any money in a bank. The important thing to consider here is that one of the ways to try to protect yourselves against unexpected events is the above mentioned. Also, don’t forget that even then, failure is always a possibility. “A trading strategy might not work” is not merely something to be tolerated; it’s something to be sought out. Trading is more about learning how to swim and staying on top of the surface than it is about escaping sinking. The amateur trader is afraid of sinking, while the professional trader just wants to swim further. Sinking is not an option, although it certainly is a possibility. Not necessarily in this order, those are the three of the major ingredients that distinguish the professional from the amateur trader. Human beings have greatly exaggerated the risk of sinking, without celebrating the value of swimming. In one of my articles, I do describe the process of becoming a professional trader. Some say it takes 10,000 hours to master anything including trading and possibly they are right. Check out my article yourself HERE. Successful trading has no easy-to-follow manual; no guaranteed method. It’s like tracking without a map. Trading is like trying to find the final destination without a GPS. It is a journey of self-discovery that does not guarantee success. REMEMBER: The only guarantee that trading gives you is the possibility to re-discover yourselves. Professional traders know that and they are not even looking for guarantees. They know that if something has worked in the past that does not necessarily mean it will continue working when they take the next trade. Professional traders also know that a big chunk of successful trading lies in knowing how to properly manage risk. NB: You cannot be a profitable risk taker if you don’t know how to manage risk. So, what a lot of mentors are missing is to start from the risk management part. On the contrary, I have discussed this topic extensively in my trading strategy. In fact, my whole trading programme is constructed around the concept of how to managing risk properly. I do also have an article about money management for the more junior traders. In the end, what makes a professional trader happy is not the quick trade. It is the methodical, well-thought out and planned process of achieving consistent results. Professional trading is almost like waiting for a certain setup (THE SETUP) to appear on your charts and then just following a preset number of rules. No two trades are alike, but there are certain similarities that professional traders are constantly looking for. In fact, successful trading could be boring if you measure it by the methodology. Paradoxically, it is probably the most mentally and psychologically challenging job out there. I don’t think there is anything like it, at all! In the end, great traders are one-trick ponies! The basic part of a training camp is all about eliminating the grit and everything that interferes with the coherence of the group. It’s human nature to want to remove all bits that gum up the works and make a trading situation unpredictable. The grit in your spinach is exactly the same grit that humans seek out in a leader or a trading hero. Sandpaper is measured in terms of grit- or its ability to stand up to resistance. That’s what professional traders do best- being able to stand up in the face of adversity and do what’s right for their P/L (not their ego). Grit is the attitude of someone who realises he/she has the power to make a difference and intends to do what’s right. What would you do if you are in a losing position? It is easier said than done, but most amateur traders will go with option 1, while the professional traders will instinctively choose the second option. What makes a trader great is also experience. I have written about the 4 Levels of Trading and I trust that it takes time to reach a professional level in trading. Sometimes it is even necessary that you make some mistakes yourselves and learn from them (hopefully). If you think you are ready for a long learning curve and long hours initially absorbing all the necessary information, then you should shoot for professional trading. In case you are not ready to commit, you should not complain from mediocre results and consider trading as a hobby. Check out my Best Educational Award from FXStreet here. Again- I cannot express how grateful I am to all of my followers who voted for me and I got selected amongst so many other trading mentors and bloggers. That is your award!